The Balistreri owned and operated Sendik’s Food Market has distinguished themselves as leaders in grocery and food fine since 1926. They’ve distinguished themselves as supporters of the MACC Fund since 2008. 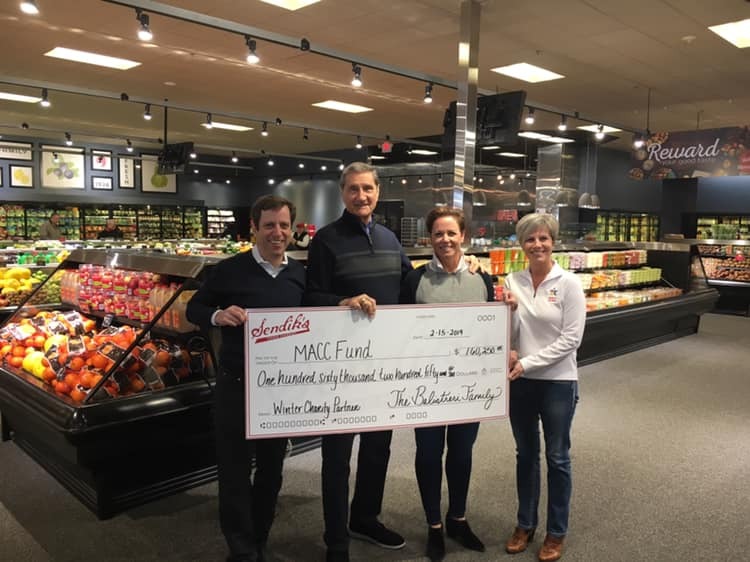 With the help of the generous Sendik’s associates and customers, Sendik’s has been able to contribute more $1 million dollars to the MACC Fund through a variety of retail programs and special offerings in-store. Want to shop with a purpose? Check out how you can support the MACC Fund at Sendik’s below and shop away! Sendik’s Red Bag for Charity is a fun way to support the MACC Fund and cheer on the Milwaukee Brewers at the same time. For every bag stolen by the Brew Crew, Sendik’s will make a $100 donation to the MACC Fund. During the 2015 season, Red Bag for Charity raised $8,400 to help the fight for critical research for childhood cancer and related blood disorders. Pick up the impressive holiday edition, of Sendik’s Real Food Magazine for $1.99 and all proceeds from the sale will benefit the MACC Fund through January. Purchase a candy cane at any store for $1 and all monies will be donated to the MACC Fund. Yes, 100% of your candy cane purchase goes to fund critical research for childhood cancer and related blood disorders! Pick up your Today’s TMJ4 MACC*Star, which features artwork from a local child battling cancer or a related blood disorder, at any Sendik’s location. Every MACC*Star features a limited edition brightly colored design on a porcelain ornament sold for $10 each (sales tax included) to benefit the MACC Fund. Stop by a store today and buy a gift that keeps on giving! Purchase select grocery items November – January that are marked MACC Fund Merchandise and a portion of the proceeds will be donated to the MACC Fund!